Hello friends! It’s make it Monday. How does a new recipe sound? Now that fall has arrived, my slow cooker will start getting its seasonal workout. I tend to use it more during the cold fall and winter months than I do over the summer, and I’ve quickly built up a list of favorite slow cooked meals. My favorite dessert list is substantially shorter, and it’s that recipe I’ll share with you today. (Our favorite slow cooked dessert recipe is only one recipe long, so far). What are your favorite treats that come from your crockpot/slow cooker? 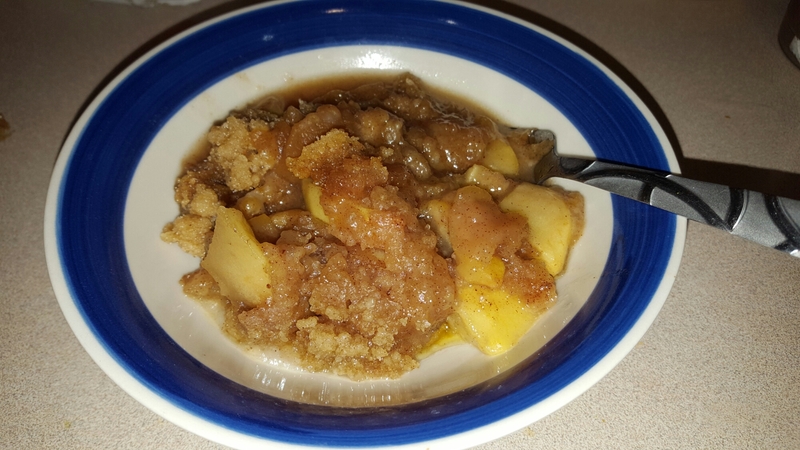 Om nom nom…Apple Crisp! Is there nothing more fall than having an apple crisp for dessert?! I think not. I’m planning to make it again (third time already, in the last month) for Thanksgiving. Eep- so excited! Here’s the recipe link. If you make it, let me know! I’d love to know what you think of this wonderful dessert! I’m interrupting my usual Monday programming for a little glimpse into my life today. 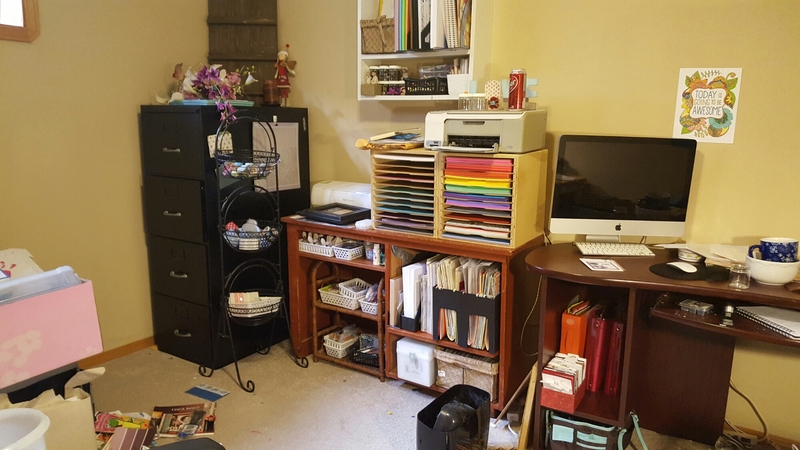 I just needed to share- I’m so freaking proud of myself for getting down and dirty and really organizing and purging my craft room. I’ve made enough room it’ll now be known as our craft room- my husband can move in and take up model airplanes, etc. too! I’m not done yet, but I got a good chunk done today. It only took roughly 4.5 hours, lol. The filing cabinet in the corner has two totally empty drawers; I have one large sterilite container, and one small one that are completely empty and out of the office; I feel like my stuff is better organized- two bags of recycling have made it to the curb, and I have two separate piles of miscellaneous stuff, one to donate to a school or kids club, and one to be brought to the second hand store. There’s still a green sterilite drawer to go through that’s full of woodblock Stampin’ Up stamps, my own personal CTMH stamps that I don’t use, and a few other random CTMH products- all to be sold (or brought to the second hand store if that doesn’t happen). There’s lots to do still, but I got a lot done too! I am not a huge fan of seeds. I don’t often eat sunflower seeds or any others, for that matter. And, if I find them in bread (such as whole grain types), I flat out refuse to eat them. It grosses me out. The texture, the taste…no thanks. There’s flaxseed in the recipe I’m sharing with you today. That wouldn’t generally be an issue, except for the feelings I have towards seeds that I outlined above. Having said that, I put my reservations aside and gave it a try. And, I’m happy to report that I don’t mind this recipe at all- and neither do my kids! Score! Did you know flaxseed is very high in fibre? 3 TBSP of flaxseed equals 8 grams of fibre, or 32% of your total daily requirement for fibre intake. Hello?! (Facts straight from the nutritional info on the side of the package). I found this Oatmeal Energy Bites recipe on Pinterest, which was originally pinned by @Hip2save. The pros for this recipe? It’s no bake, all natural ingredients (or can be), is full of fibre and protein and has chocolate in it for those of you that have a sweet tooth, like me. The only con? Waiting an hour for them to chill before you can eat them. I’d send them in my kids’ lunches if they weren’t in a nut aware school. I suppose I should make more, since I finished the last two last night. Pro: they make great bedtime snacks! I’m still itching to share my Grilled Tuna Melt Recipe, and I’m hoping that’ll be next weeks’ post, but for now, I’ll share one that’s purely comfort food. I’ve had two medium bananas sitting in my freezer since the end of July; I figured now was the time to use them up. It’s cold and rainy here these days, and it filled a small portion of a long and boring day at home with the twins yesterday. This recipe came from a recipe book that was given to us on our wedding day. It’s pretty tasty! The recipe called for chopped walnuts (optional, of course), but I substituted them for chocolate chips. I’m not a fan of walnuts. Sift together flour, baking powder, soda and salt in bowl. Cream together butter, sugar, then add eggs in a separate bowl. Add mashed banana and flour mixture to creamed butter mixture. Stir in walnuts, if desired. 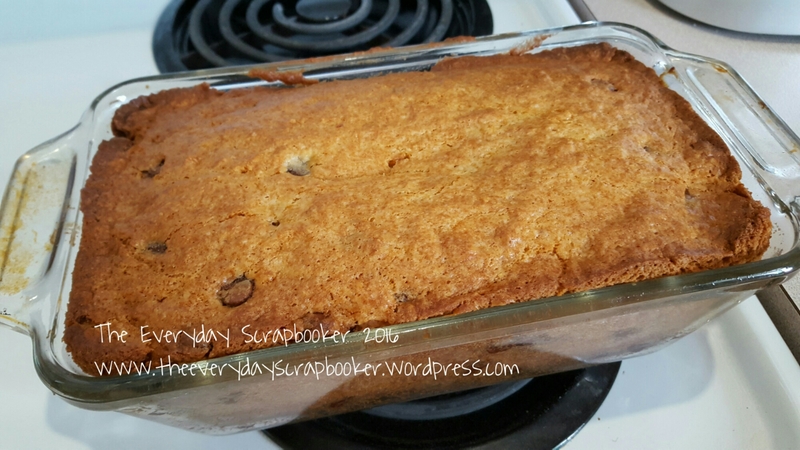 Pour into greased Loaf pan. Leave stand in pan for 20 minutes, then bake at 350°F for 50 minutes. How do you like to spend cold and rainy days at your home? While other kids started yesterday, others last week, and still others at various intervals throughout the rest of August, my kids are going back to school today. *Cue a sigh of relief. I’m not sure what my day holds yet- my husband is home but is gearing up to leave town again for the next 3 days (so he says…I won’t be surprised if it turns out to be longer), and the rains are coming. We had severe thunderstorms roll through Tuesday overnight and more is forecasted for today. We will return to walking- as long as the weather holds until later in the morning. Freddie and I (my white, four legged fur baby) need to get back to our morning walks. He’s going through withdrawals similar to my scrappy withdrawals. This year, our walk will be longer than last year (and I thought the walk was long then, lol). The twins’ entrance is on the furthest side of the school from our house. It’ll be great exercise- for all four of us! I think after I drop them off, I’ll take the “long” way home again, instead of going the easiest, most efficient way. At least, until the weather becomes unbearably cold. Then, I’m heading to the gym. Why do I mention all this talk about walking and exercise? Well, for the same reason I started sharing Make it Monday- for inspiration. I had wild success sharing what I’m about to share with you to my Instagram- people found it profoundly inspiring and encouraging, so maybe the same would happen here? It’s worth a try. If anything, it’ll be a good reminder for me, and source of encouragement. It all began with the strain of our economy and finding ways to save money. But, at that point, what I had to do was just in my head, and hadn’t been put into action, yet. Mostly because I was lazy and comfortable- I’ve always struggled with motivation and self-restraint. I have very little will-power. Can anyone relate? In the midst of trying to sort out some health problems my husband was (and still is) battling, my husband was diagnosed with pre-diabetes. As a result, his doctor wanted him to take some health classes at our local hospital. He asked that I go along with him. I obliged. I never thought what the dietician would say would have such a profound impact on me. I took her words- and advice- to heart. I made two small changes, and the result has been incredible. The changes? I cut pop from my diet, though I do indulge in the occasional one every so often. The difference is I don’t drink them like my life depends on it anymore. In addition to cutting that sugar out of my diet, I began walking. I began walking to 1) save money by burning less gas through driving and 2) to help my body turn the fatty and sugary foods I was still eating into energy instead if letting it be stored as fat instead. By March of this year (I began making these changes late last year), people began asking me if I was losing weight. By April, my clothes- especially my jeans and a skort I own- started becoming looser. When I began, my goal wasn’t to lose weight. I only wanted to become a little more healthy, in an effort to cut the chances of developing serious health problems- and worse. We’ve experienced losing enough close friends to unexpected deaths for various reasons, I didn’t want to be another statistic. Losing weight was (and is) an added bonus. I am trying to teach my girls to be healthy- what we weigh shouldn’t matter, as long as our bodies are healthy. That means keeping everything in balance. Eat your sweets, but get your feet moving to facilitate your body’s job of absorbing and breaking down the food you eat. I hope that I can live by example for them, and I hope that’s enough to foster a positive body image for them. I hope the same for my husband, too. Even though I am making a big deal about losing weight here on my blog, we don’t make a big deal about our weight or what each of us looks like in real life. Our main thing is eating fresh and moving our bodies. We all come in different sizes and shapes; it’s what makes us unique and beautiful. I will never have a flat tummy or a space between my thighs. That’s ok. As long as I’m healthy. My daughters may not either, but they’re still beautiful. They should never feel ashamed of how they are built or look. I was overweight when I began this journey. I don’t know what I weighed at the beginning- I avoided the scale like the plague. We also did not own a scale, so ignoring the obvious was easy. I think I weighed around the 200 pound mark. When I began recording my weight, I honestly thought I’d lost 15 pounds. Maybe. When we were at the hospital for healrh class, or to meet the dietician, i woukd use hwr scale to record my weight. I was elated to find I had begun losing weight. Until recently, I didn’t think I’d lost as much as I have. When I finally took a before/during picture, I was astonished to see I’d lost closer to 30 pounds. My husband was astonished to see the change, too. I like how he looks at me now. It’s flattering and insanely encouraging. 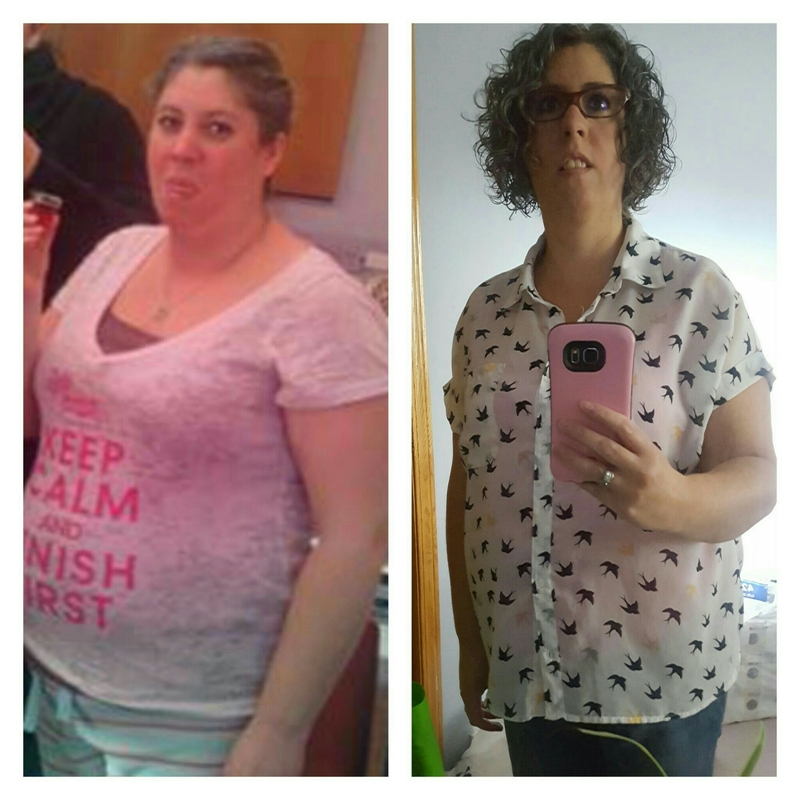 Since the picture on the right was taken, I’ve lost one more pound. I’ve added eating more fresh fruit and veggies into my diet since my journey began, as well. Which is why I began sharing recipes with you. I am still the girl with no will power and a sweet tooth that’s larger than she is, so youll sometimes see comfort food, unhealthy recipes. But, I’ll also share better for you recipes, so when I find ones that are quick and simple to make and are super tasty, I have to share! One important thing to remember is to start small- choose just one thing to change. Keep on it until you master it. Then add something else. Once that’s habit, add something else. Don’t overwhelm yourself by cutting everything “cold turkey” and set yourself up for failure. I think that was the key to my own personal success. I set myself up for success for once. It’s easier than you think! (My first skinny girl outfit). And, for the record, I’ve wanted a form fitting denim jacket for eons. I scored one yesterday at Reitmans. Head to your local Reitmans to get your own. I’m not done yet. I will keep making changes, and I want to lose more weight. For instance, with my newfound love for smoothies, I’ve unintentionally cut my bread intake in half, probably more. It’s another change that I unintentionally made by deciding to eat more of something else. My goal is to lose 29 more pounds by next August. (It was 30, but I’ve lost another pound since setting my goal and making a plan to achieve it). If I don’t lose as much as I want? I’ve already surpassed my expectations with where I’m at now. I’ll be satisfied with wherever I end up. The point is making my body healthy, not looking like a model. Anyone want to join me on my journey? Do you have a weightloss/get healthy story you’d like to share? I’m really excited to share today’s Make it Monday post. I’ve mentioned this recipe a couple times now, and it’s time I finally shared it! Truth be told, I finally just made it (which enabled me to take a picture of it), so now I can share it! This recipe, called Mac Chicken Cacciatore, is another wonderful Kraft Canada creation. It was an instant favorite in my household (though my kids like trying to tell me they hate chicken in their macaroni), and it’s always gobbled up. Quick and easy is key in my household! Making this meal is easy peasy. Make your Kraft Dinner as per the instructions found on the box. In the meantime, once your chicken is thawed, cut breasts into bite-sized cubes, then brown in a skillet. Season as you like. 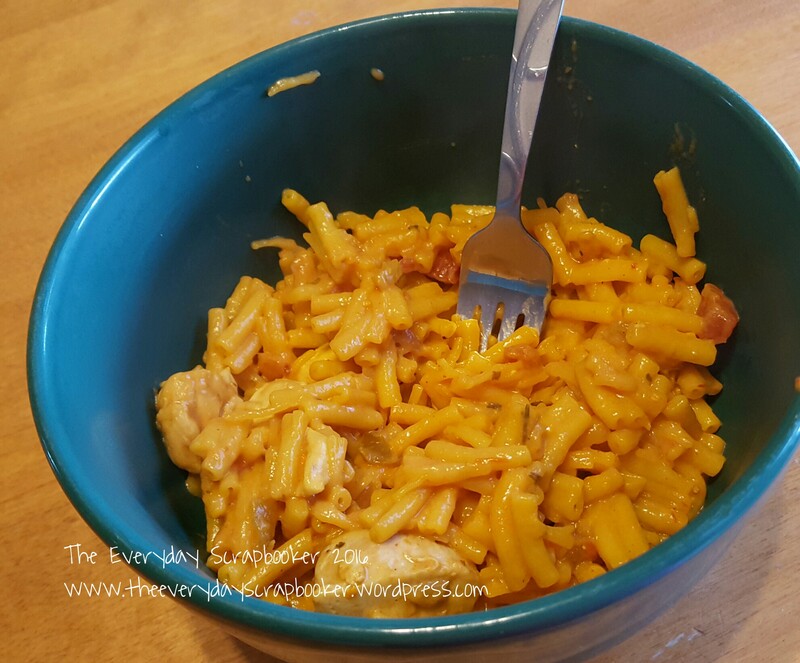 Next, mix cooked chicken into your Kraft Dinner, along with some salsa (I usually mix roughly a 1/2 cup into ours- I make two boxes of KD so there’s enough for all 4 of us to eat). Voila! Dinner is served! Steamed broccoli pairs nicely with this dish, as does carrots or a salad. Are you a smoothie lover? Have you ever made your own smoothies? I scored big time when I came across a couple Kraft Canada smoothies- I hit the jackpot with the Kraft Peanut Butter Banana smoothie and the Green- Protein smoothie (recipe coming next week). The recipe that I pinned says it’s vegetarian and gluten free, for those that prefer a cleaner food choice. 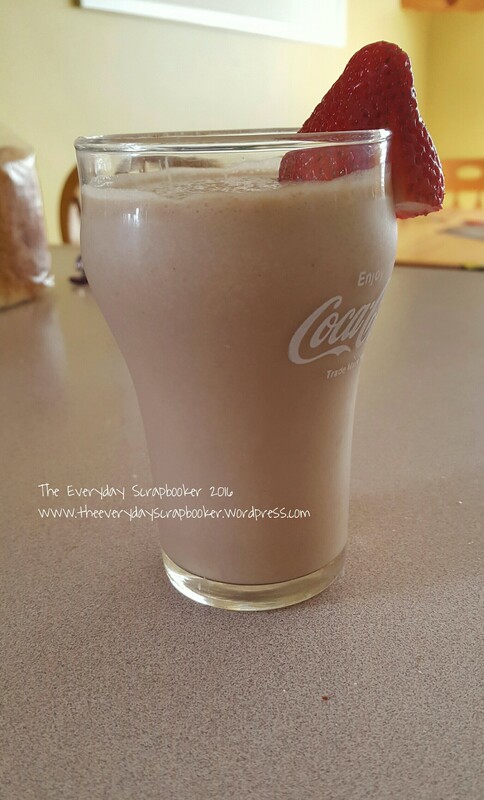 My kids LOVE this smoothie- it has chocolate milk in it (I make my own using 1% milk and chocolate syrup. That way I can control/monitor how rich it is); that’s their first favorite food. Their second favorite food is bananas. I really enjoy it too! The chocolate flavor appeals to my sweet tooth but the bananas in it packs a bunch of healthy nutrients and a nice balance to the sweetness of the chocolate. SO tasty– especially in my little Coca-Cola glass! 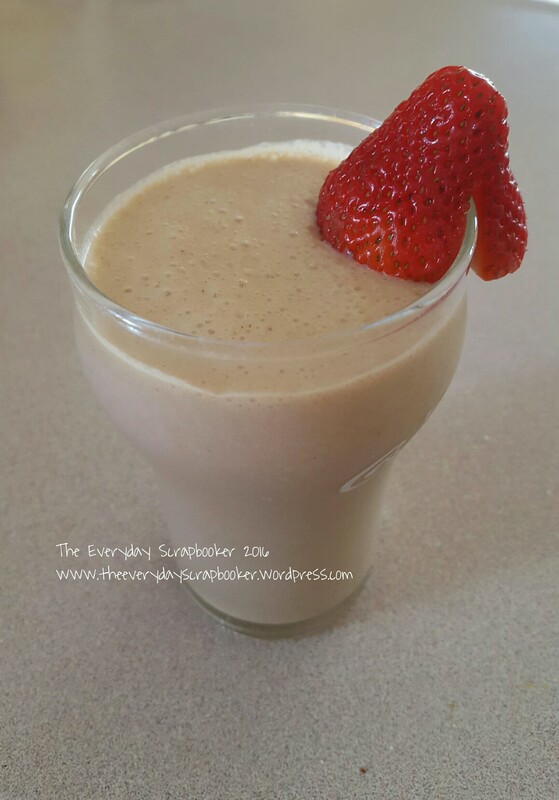 Perfect for a snack or for breakfast, I highly recommend trying this smoothie- it tastes good with strawberries in it, too! Good morning, dear friends! I’m all showered up (how I missed my shower!!) and ready to take the dog to his spa appointment (groomer). We have a slow week to recuperate (unfortunately, my husband doesn’t. They tried sending him to work before we even got home from vacation! ), then we have two more weeks of swimming lessons. One fateful day in the recent past, I came across a Kraft Canada recipe that the twins were sure to love. 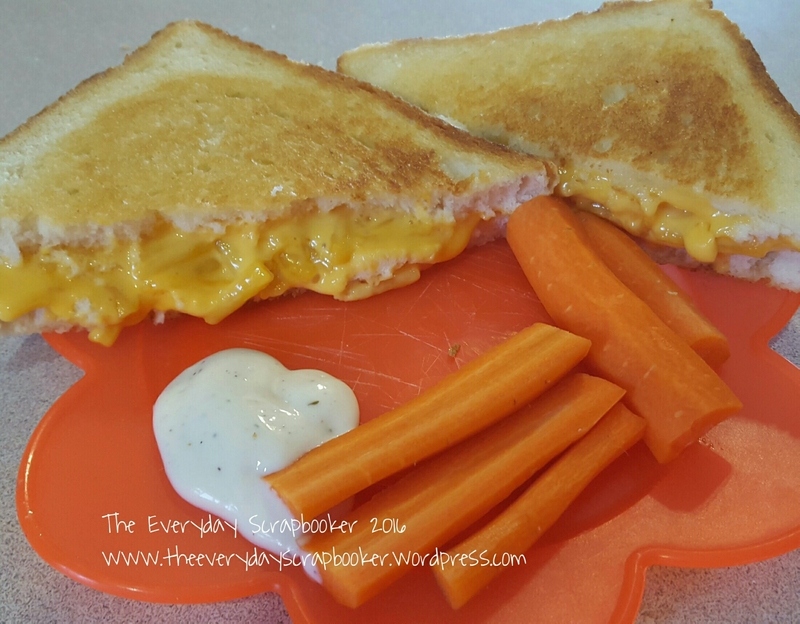 It is a cross between grilled cheese and kraft dinner, and it is completely kid friendly! Introducing Grilled Macaroni and Cheese Cheese Sandwiches! Before adding your second slice of bread to your grilled cheese sandwich (and before grilling), add KD to your sandwich and a second slice of kraft singles cheese. (Remember, the recipe and link will be included at the end of this post). And, between you and I, this recipe is a heart attack waiting to happen. Lol. All that cheese can’t be very healthy! Pure comfort food, y’all. Seriously. Enjoy with tomato soup and a side of veggies, or a salad, and/or a long, leisurely walk or step aerobics class. For me, this recipe fell flat. It was flavorless, and if I make it again, I think I’d add the KD to a grilled Tuna Melt, or I would make my Chicken Cacciatore (both recipes coming up in the near future!) before adding it to a grilled cheese sandwich. (My Chicken Cacciatore recipe is made using Kraft Dinner, as well). I’m not always a huge advocate for meat (I’m ok with meatless recipes; my husband isn’t.) He’s a proud “meatatarian”. This recipe required it, in my humble opinion. Chicken or tuna would pair nicely with this to make a slightly more well rounded meal. As promised, here’s the Pinterest link to this fabulous, kid friendly recipe. Let me know what you think when you try it! 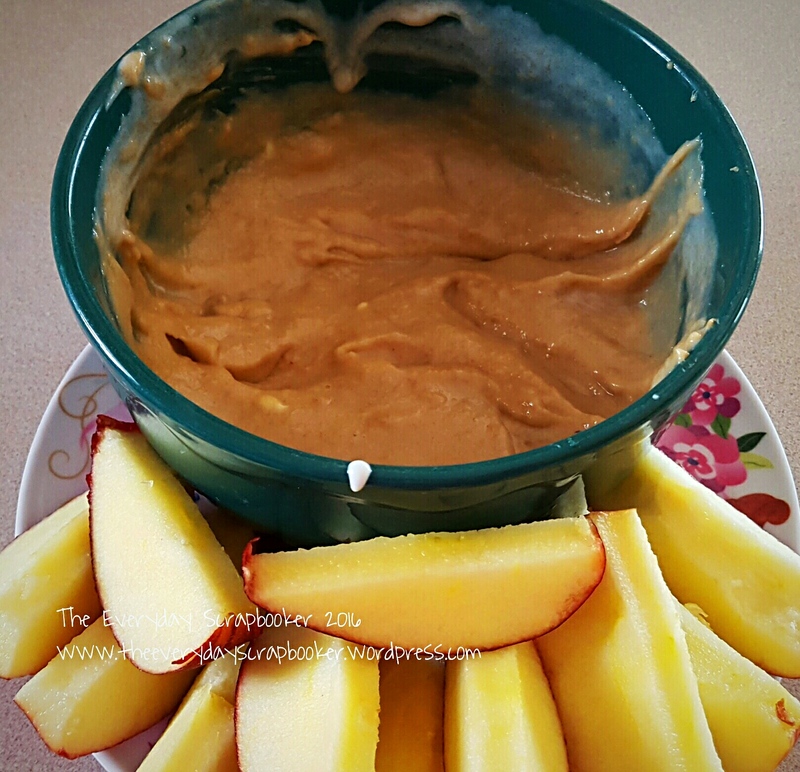 Today, I thought I’d share a healthier alternative to snack on than last weeks’ recipe. Over the last year, we have been working on improving our diet and daily routine in an effort to improve our health. My husband was diagnosed with a lesion on his pituitary gland in his brain (it’s not serious), but it’s shown us that in addition to HRT (Hormone Replacement Therapy), eating better and getting more exercise would benefit us. Especially since my husband is overweight and a smoker. He is also pre-diabetic. Did you know that pre-diabetes is a misnomer? It doesn’t actually mean that you’re on the verge of getting diabetes; you actually have it but it’s in the very earliest stages of the disease. With proper nutrition and exercise, an individual is completely capable of staving off the negative effects of this disease until much later- which is what a diabetic wants to do! (Or should). (Link at the end of this post- it’ll take you directly to my Pinterest pin). This dip is just three ingredients, and it’s so tasty! It got my kids’ seal of approval, too! Make as much or as little as you want- I quadrupled the recipe (I think!! That’s a very broad generalization, lol), and my kids gobbled it all up. I only got a couple slices (I cut up two Gala apples for the three of us to share; I barely got the chance to taste the dip!) It’s healthy, quick and easy to make, and (I think) the perfect dish to bring to a potluck or serve at a party. Your guests will love it, too!